Captain Toad: Treasure Tracker has been Nintendo's greatest 2014 surprise, announced at E3 and rapidly turned around for a Holiday release — in North America, at least. In theory it's a new IP, too, taking the cute but minor Captain Toad character and providing him with his own game; the whole concept is a spin-off from the Super Mario 3D World bonus challenges, of course, highlighting Nintendo's approach to taking a good idea and expanding it fully. The challenge is ensuring that Captain Toad and Toadette can carry a full retail game, albeit at a slightly lower price; Nintendo succeeds, for the most part. 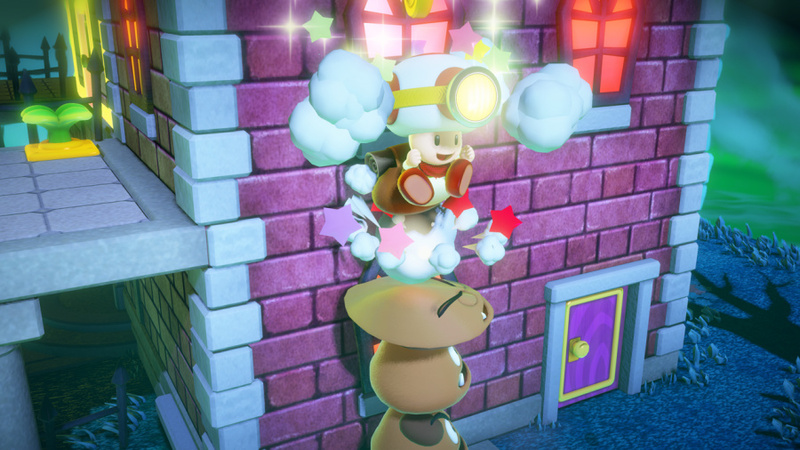 The immediate impact when firing up Captain Toad: Treasure Tracker is one of pure, untainted charm. Initially there's not even a title menu, as you immediately take control of the Captain to meet Toadette and claim a star; it's an early opportunity to become acquainted with managing the diorama-style environment, too. It's utterly adorable, and we've seen it charm and bring smiles to children, this 30 year-old reviewer and older gamers. When it comes to cuteness, Nintendo's got it down. That's an ideal start, then, and early stages do a solid job of introducing players to the core mechanic and challenge in this title — the camera. The vast majority of stages are small dioramas, isolated mini-worlds that encompass one large puzzle. It's a clever concept that's well implemented, and shows the confidence of Nintendo in the engine and the puzzles that it's created that you have substantial control, tilting the camera in all directions and generally taking in the whole 'world'. It's impressive and daunting at the same time, and an immediate hurdle for less experienced or younger players, who are likely the target demographic with this sort of release. The most effective way to navigate the camera is with the right stick, while you move with the left stick and dash or pluck items with A, B or even Y. An important tool is the camera zoom with the X button, which works on most occasions and is vital in some of the larger environments; while a wide view of the stage is helpful in scoping out a route and collectibles, there are certainly moments where it's vital to take a closer look. On paper, then, it's a simple setup. The camera, as we've stated above, does add a degree of complexity. It's relatively easy for those that have been around the block in gaming, but is a step away from the impressive work Nintendo's done in the past in framing the action to make life easy for those learning the ropes. It's essential to the concept, however, and for the most part the tempo is sedate enough that you can pause, take in surroundings and plot the next move. An alternative means of control is to use the GamePad's gyroscope, focusing on the controller's screen: movement is less pronounced, but it's an instinctive solution for those struggling with the stick, albeit with visuals that are noticeably less colourful and attractive when streamed onto the low resolution screen. There will be occasions when all players, regardless of ability, will have their eyes glued to the GamePad screen. This is a title that actually makes strong use of the GamePad, and some stages require you to manipulate environments with the touch screen — this can involve tapping blocks to shift their position, rotating levers to move platforms and ramps, or occasionally aiming weapons. As showcased a good deal by Nintendo, there are on-rails mine cart stages in which you fire turnips at enemies, blocks and collectibles, and we found that primarily aiming with the right stick and making small adjustments with the gyroscope provided terrific accuracy. Children may have fun relying solely on motion control, standing up and spinning on the spot — essentially looking through a window into the world. Throw in propeller-powered platforms that require you to blow into the GamePad's microphone — as also seen in 3D World — and you have some fun use of the unique controller. That GamePad reliance also explains why it's required for play, with no other controller supported. That does highlight, however, a primary complaint: that there's no way for a second player to participate and 'help' Captain Toad or Toadette. While the single-player approach is understandable considering the concept, the fact this is a game that may be enjoyed by lesser-skilled gamers means that the absence of a means to assist — think Super Mario Galaxy — is an odd oversight. There's a lot of game management — in later levels particularly — when worrying about the camera, being rushed by enemies and also chasing collectibles; the option for a second player to highlight areas or slow down enemies with a Wii Remote pointer would make tougher stages far more forgiving. As it is you can disrupt enemies on the GamePad's touch screen, but holding an enemy while moving — possibly also using the dash button and shifting the camera — is actually impossible without three hands. This isn't a problem for experienced players, but the going will get tough for some, making the absence of this simple co-op a surprise. With that in mind, what this does represent is pretty decent value for those keen to experience Nintendo charm that, perhaps, typically prefer easier, motion-controlled games. It's a step up for those used to Mario Kart or Wii Fit games, and in that respects this is a nice entry point. Without the jumping and precision of a platformer — it's all about Toad and Toadette being weighed down by their backpacks, it seems — it provides a unique challenge that doesn't require twitch reactions. Another accommodation for those that will struggle is the now-standard invincibility item, bestowed after too many deaths in a stage and a huge help when navigating the environment and worrying about enemies is too tough. For enthusiastic players, meanwhile, the challenge won't come from deaths — game over screens will be a rarity — but in grabbing all three gems in every level and completing optional objectives. It's classic Nintendo, catering for a range of players. In terms of value, Nintendo's faced a tricky challenge in defining where this game fits in the marketplace, opting for a 'budget retail' approach. Experienced gamers will certainly blast through the 70+ stages — split into three 'episodes' — in eight hours or less, though may find another couple of hours in retreading stages to grab more gems and unlock some final extras. That play time can be greatly expanded for fans with less natural skill, meaning that there's decent value to be found; the strength of the title, beyond this length, is that this diorama puzzle approach feels unique and fresh, not just in the general market but even within the Wii U's own library. Those Super Mario 3D World origins, too, bring us some truly lovely visuals, with chunky but colourful assets that look simple but attractive even when viewed up close. It utilises the same engine and has that Pixar brought-to-life feel, while the accompanying soundtrack drops orchestration in favour of upbeat, light-hearted ditties. 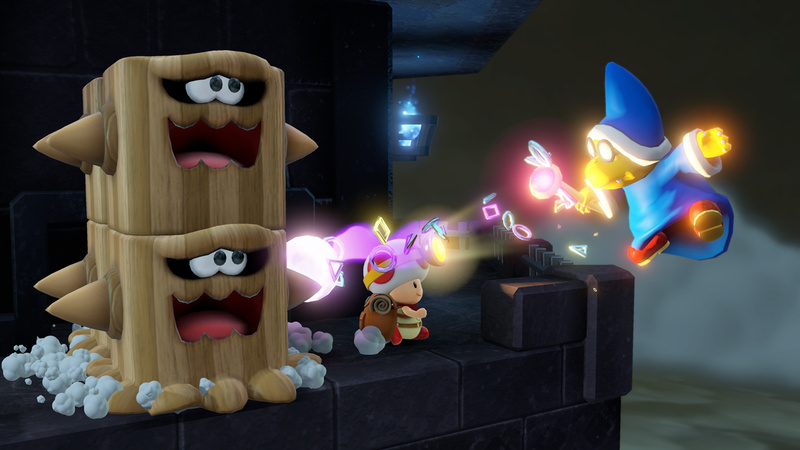 Despite some repeats of boss levels, we're also treated to a wide range of environments and design tricks, with the Cherry item returning to bring us some of the best puzzles with duplicated Toads. There are lovely extras, too, including a few stages recreated from Super Mario 3D World, with ramps to help the jump-less Toad around; these are available early-on if you have the platformer's save date on your profile, or becomes available to everyone else eventually. Taking the whole package together, this delivers another distinctive and unique experience on the Wii U. We're frustrated that there's no obvious means to assist young or struggling gamers, but aside from that we're struck by the joyous design and clever approach that runs through the experience. It's primarily a puzzle game, but finds a nice balance of complexity and accessibility to make its own impact and, we hope, lays the foundation for more in the series in future. Captain Toad: Treasure Tracker is a rare case of a game that feels truly designed — from the ground up — with the Wii U in mind. The GamePad is utilised just enough to be worthwhile without being a nuisance, and the only mis-step is that the difficulty later in the game can't be eased by assistance from a friend, parent or game-savvy son or daughter. That aside, it's relentlessly charming and joyous, and is another example of Nintendo's developers flexing their creative muscles along with game-making skill. There's nothing else like this on Wii U, and it's a welcome addition to the system's growing library. The hype is real! Can't wait for Christmas! How could you guys review the PAL version? Us mere mortals have to wait till next year for it. Well here's a reason to recharge my Wii U gamepad's battery again. I'll be buying this when the european release date arrives. I really don't feel that the absence of a multiplayer mode ought to affect a single player game's score at all. Focus on what is there, not on what was never hinted at or intended to be there. Not every game needs a multiplayer mode, regardless of how "easy to implement" you might think it'd be. @PALgamer That's a good question, we did indeed review a finished PAL code. I've complained about the EU release date before! Why do we have to wait for the new year in Europe? Argh! Great review! Can't wait to play! Does the 70 level # include the bonus levels from SM3DW? What's a "rans"? "rotating levers to move platforms and rans"
Too bad there's no overworld map like in NSMBU and SM3DW. I like the idea of a book to tell me what items I've collected - the early Spyro games had it waaay back when - but I really like navigating my way around on an overworld map. I really wish DKC:TF had a "now-standard invincibility item" so I could have gotten past that crumbling bridge in W2-L2. A 2nd player would have been nice like the review says, pointing w/ the Wiimote, guess it's time for the little ones to grow up. Really important question - is there off tv play? I didn't see this addressed in the review. Seems like a nice game for 1 kid, or me, to play while the others are playing real games on the tv like SSB, LBP3 or Skylanders Trap Team. What's the word on amiibo? This is one of the games on the amiibo poster is it not? Questions aside, looking forward to playing this one sometime after Christmas. It is unreal how much fun I had with the demo of this. I am really looking forward to owning this. Not bad, can't wait 'till Christmas. I can't wait to play this one. It's a shame it got pushed back to 2015 for Europe, I guess Nintendo decided it was better to stagger some releases after all. Those of us that have to wait might be cheered up by the fact Amazon UK have this up for £25. Getting this on Friday when I get home. And next day a friend will give me my copy of Smash U. A very busy weekend for my Wii U. @Captain_Toad So hyped for your game! NoE, just put it on the eShop if you don't want to release it in its retail form yet! So you got a download code for the game in Europe? So it actually already IS on the eShop, just not purchasable! Everyone that owns a Wii U needs to get this game. @Assassinated well and nuff said! Glad to hear this game is as good as everyone expected. I'll get it somewhere down the line, just have to buy a Wii U first. As a PAL gamer I actually find it a good thing that this is coming out after New Year - I'm already drained from funds before Christmas, and also that will allow me to enjoy Smash more with family and friends. We're getting it, but most likely not till Christmas. Can't wait. Video game overload to the max! Got mine in pre-order but the wait is unbearable. I also think a January release for the game in Europe is going to outright kill it in the sales department. I still question Nintendo’s decisions with Europe. Sometimes they release awesome special editions unavailable elsewhere and then other times its like they want to fail over here. I want to get this game, but I'm still yet to get Smash U. Looks good, but I'm really short on cash after Smash, the GC controller adapter, Omega Ruby and Black Friday. I'll most definitely get it someday though. Biggest gripes seem to be that it's not too easy, or that it doesn't have features that reinforce the incorrect notion that this is a small child's game like parental assistance built in? Still sounds a bit light on content, despite $40, but I'm gonna get this Day1 anyways. Is there any word on preorder/preload for this yet? I think this game and Hyrule Warriors will be my fav games on the Wii U. This looks really good. I was on the fence about it at first, but I think I am going to get it eventually. However, I will be getting Hyrule Warriors, Bayonetta 2, and Smash Bros before I get this. This review read a lot like one from Family Gamer but minus some of the expected enthusiasm for the content. @DiscoGentleman Ya no doubt. Docking a game for not having multiplayer is absurd IMO. Obviously, not all games are meant for more than one player and this one requires the gamepad. Which is exactly what people wanted. Can't have it both ways. Looks like too much of a mario 3d world clone to me to justify buying it, although i did enjoy the toad levels in 3d world. Smash and Mario kart will hold me until Splatoon comes out next year. Splatoon is my most anticipated game next to smash for the wii u.
I'm betting this was delayed due to NOE having to get a large amount of Smash Bros discs printed before production starts on this. My theory was reinforced by stories of a lack of Smash Bros stock in stores at release. Only $40, new Toad IP, beautiful level design, unique puzzle/platforming... why should I not buy this game?? @DiscoGentleman It is also odd because most other reviews said it wasn't that difficult so no 2nd player is even necessary. Not really the kind of game where co-op is a huge deal for me, so I'm more than fine with it. Definitely giving this one to myself as a Christmas gift. The game is only 2GB, so I doubt they will make a preload for it. I really need to get this game. Hopefully I can get my hands on it sometime after Christmas. Only 4 days for the cutest game of the year!! Can't wait! Glad to see it got a great score. I hope they allow pre-order at least to take advantage of the DDP before it expires this year. Toad never got to star in his own roll. Sure he was a supporting cast member in SMB2 / SM3DW, and was the main protagonist in the action/puzzler Wario's Woods. Glad to see him getting his own starring role in a platformer. The inability to jump also makes Mario fans think outside the box. Either way, I hope they make a Toad/Captain Toad Amiibo. Oh well, more time for Pokemon and Smash. This will be an after Christmas purchase for me. As much as I absolutely would love to pick this up this week, I've spent far too much money on games in the past month, and with Christmas fast approaching, I have presents to buy for others. I don't know why the help of a second player is such a big deal. It's like you're comparing the game to Galaxy which you are. Anyways I'll definently get this. Looks like pure fun with a nice price tag. This game will probably end up being one of those 'most underrated' games on Wii U. Not words I'd like to here together. The demo was great. Can't wait to get it for Christmas! To all European people on this site, I am very sorry for you. But hey, you got Fantasy Life first at least! @rjejr Yikes, that's supposed to say ramps, I've corrected it. The game is essentially always off-TV, though I didn't explicitly say that. It always mirrors the TV, so it's immediate when interacting with the environment and, most important, is there for those that want to work the camera with motion controls. On amiibo, its functionality isn't live yet, I think Nintendo always said this would be in a 2015 update. Unless the company has a surprise up its sleeve we'll just need to wait. @gage_wolf and others asking about my comments on co-op — I'm not a parent, actually, but my job is to assess what a game is trying to do and how well it does that. So while I praise this game plenty, gave it an 8 (a good score, remember!) and loved playing it, I look at it as a project and feel that it's another game perfect for a family audience or less experience players. Whether that's kids, parents or otherwise; for example my parents have a Wii U and enjoy games like Mario Kart 8, Lego City (after taking a while to get used to working the camera), Nintendo Land and download stuff like Toki Tori 2, Edge and Thomas Was Alone. I had a chance to show this to them when I visited home, and though they like it and plan to buy it, managing the camera was a real learning curve. The game gets pretty darn tough, so it'll take them a long time to beat it, I suspect, as it'll feel pretty unrelenting at points. So I feel that could have been alleviated a little, especially as a game like this will attract the attention of a wide range of Wii U owners. That's awesome, I hope it sells well, but an option to help the player in tough levels, assisting with a Remote or whatever, could have been a nice inclusion. No 9/10? Oh well, its still a good score. I didn't honestly expect there to be any sort of co-op in the first place, so this definitely won't hurt my chances of getting this game. I'll probably have to wait a while though, since I am already busy with plenty of games right now. Definitely won't be getting it at launch at least. Review is not well written (as was the case with Watch Dogs) and that is a surprise!!! I went to see the score first and then read the whole review. I can understand wanting to see a multiplayer component featured in Captain Toad, especially when multiplayer is unfortunately impacting the designs of major Super Mario releases, but I don't recall a co-op feature ever being mentioned for this title. I don't get how that turned into a -2 for the game. I would love to bring Pushmo's score into this regarding getting assistance from other players, but I can't, as it's done by another reviewer. Funny how that always ends up being the case. I'm not all that worried about Captain Toad. I definitely plan on getting the game, more so now after seeing the score on this site, and I believe I will enjoy the title more than I have Super Mario 3D World easily. 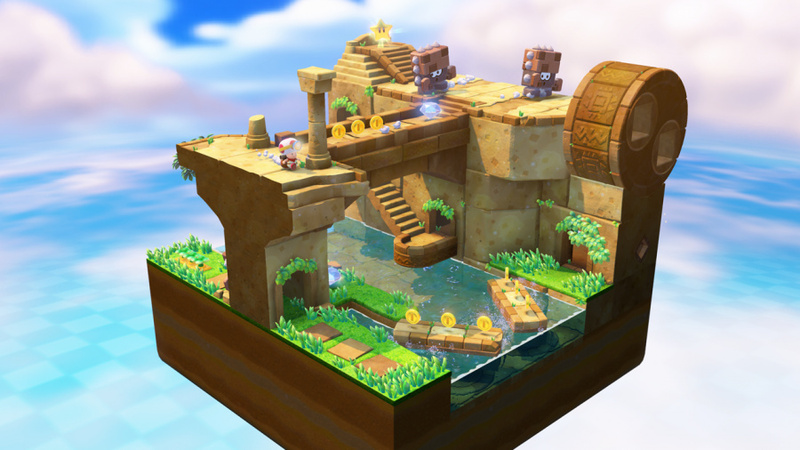 The most unique levels in that game were the Captain Toad levels in my opinion, and to have them fully featured in a full game is going to be awesome to experience. I'm also glad that this is a single player game. There hasn't been a single player designed Mario release on console since Super Mario Galaxy 2, so it will be refreshing to play this spin-off experience alone from start to finish. There will be no disconnect transitioning from multiplayer to single going through this puzzle adventure. I'm excited for Treasure Tracker. @Captain_Toad I need that!!! Where is it available?!?! Getting it on Christmas I hope! Sounds like it'll be a Wii U game that's great but won't sell as well as it should. @MrGawain They could just put it on the eShop earlier, though. Does this game use Amiibo yet? I heard that it would use them soon. @Captain_Toad Where can I get that plushie? Looks really cute! I wonder how it'll use amiibo. Hope I can get it for Christmas, but not sure due to wanting Hyrule Warriors or Tropical Freeze as well. I'll pick it up at some point as it sounds decent. Can't wait for this it's so adorable!! Amiibo isn't active in the game, to those asking, Nintendo's always said this was planned for 2015, though it'd be neat if it's a surprise for this month. good points and nice review.... I wish I could get this at release but gonna have to pretend I live across the pond and wait till 2015!! I will be getting it for christmas! @ThomasBW84 - "It always mirrors the TV"
Well that's good to know. I played the demo and I know for the most part that was the case but for the first person minecart levels I thought there might be a problem. I can imagine somebody always playing this while the family is gathered round the living room. @rjejr The mine cart levels are one exception — you aim with the GamePad screen which is a first-person view, while the TV shows a different view which is pretty nice to watch. It's entirely possible to play these on-rails levels with the TV off though, it's just for a bit of show in these stages. I want this game so bad! Toad was always my favourite character to play as in Mario Kart 64. So pleased that he's finally got his own game! Which Amiibo's, and how does Amiibo works in this game? @sinalefa Ah thanks, I didn't realize it was so tiny Considering I did quite a few 40-50 Gig downloads for games over the last couple of weeks ... ^^ No need for a prelaod then, fair enough! 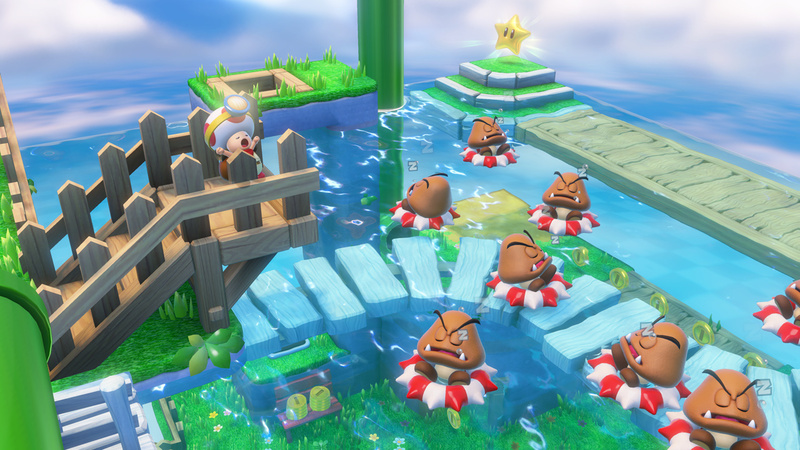 As a huge fan of Super Mario 3D World, and particularly it's Captain Toad sections, I'm ecstatic about this game, which is easily one of my looked forward to games of 2015 (still find it strange that those of us in the UK and EU get it later, but a January release date does make more sense than releasing it around the time of SSBU and Pokémon Alpha Sapphire and Omega Ruby). The addition of a co-op function would have been great, and is something I feel many people were expecting once Toadette was introduced. It's a shame that this is not a feature, and I feel you did a great job explaining why in the review. I certainly don't mind that this is game comes across as on the short side, I don't often complete games as it is, and it sounds like their is plenty of replay value anyway. I'm really happy to hear that the game is even slightly lower in price, this I did not know, and it sounds like a great way of doing things. I love the Wii U Gamepad so a game that draws a lot of it's potential is pleasing to hear. All in all, a great review for what looks to be a great game. 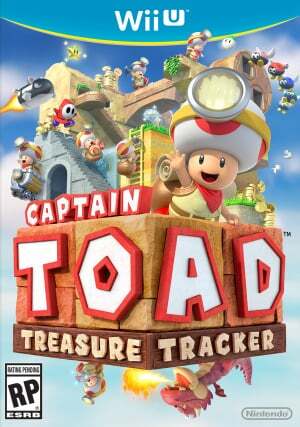 I'm looking forward to playing Captain Toad: Treasure Tracker. Maybe I'm missing something but isn't this not that dissimilar to a 3D Toki Tori? Admittedly, I'm only basing that on my Super Mario 3D World experience. @Assassinated Completely agree with you. There's arguably too much focus on multi-player these days when I suspect many game players still play on their own. Games should be reviewed according to their own merits or otherwise. "Amiibo isn't active in the game, to those asking, Nintendo's always said this was planned for 2015, though it'd be neat if it's a surprise for this month." @cornishlee The stages are more complex than in 3D World, and this is a very different experience to Toki Tori (1 or 2), perhaps if there was a '3D' Toki Tori it'd be kind of like this, but that doesn't make this similar to the actual games on the Wii U For those that enjoy those sorts of titles, however, then this is certainly the sort of experience they could enjoy a lot. Loved the levels in 3D World, still don't get the delay in Europe, but hey will get it when it come sout next year. Will be getting for Xmas. I'm going to assume that when amiibo support arrives they'll be used to put in character themed costumes like MK8. I hope this game finds a surprisingly large number of sales. I like that it's a bit of a risk and a different type of game. A little interaction from a second player would be nice and these types of puzzle games always have difficulty issues because sometimes the solutions to puzzles are just outside your line of thinking. In that way, a couple other people gathered around will be helpful whether they can directly interact or not. Sounds like I'm going to love it, though. Can't wait! @rjejr : Thank you for the information. Does it have the content that its price seems a fair deal or not though that is the question. (80% of the content of 3D World or Smash Bros would be fair seen as it is 80% of the cost). The toad mini games were my least favourite part of Super Mario 3d world...So i will be skipping this one. I'll follow Toad for life... this is definitely on my to play list. I'm not into Amiibo but I'd buy a Captain Toad Amiibo in a heartbeat lol. I think this could be the start to an awesome new franchise. I actually would like to see this on 3ds. No, not NEW 3ds, 3ds. I cant wait to get this!!!! I can't wait to get this game! Check out this "Captain Toad in Real Life (Prank)" video, pretty funny! What is the new invincilibility item you get after getting a few deaths? Overall Captain Toad Treasure Tracker has been a good game. I really wish there was two player though as my sister and I have to watch each other. Using the Gamepad to stop enemies and break blocks while another person was Captain Toad/Toadette would have been great. I feel like that was a missed opportunity by Nintendo. Also there is a strange absence of gems from the Super Mario 3D levels. It would have been nice to have other collectibles besides coins and stars in those levels. That being said any fan of puzzle games or enjoyed Cpatain Toad levels in Super Mario 3D World should pick up this game. It provides many hours of fun gameplay and it might be fun to replay it again sometime. I agree with the 8/10 review. The lack of multiplayer as well as the lack of collectibles in the Super Mario 3D World levels bring this game down a couple points. However the charm and creative gameplay make this game a great experience overall. It'll be interesting to see how amiibo is integrated into this game and I agree with most people in saying that it'll probably be costumes. 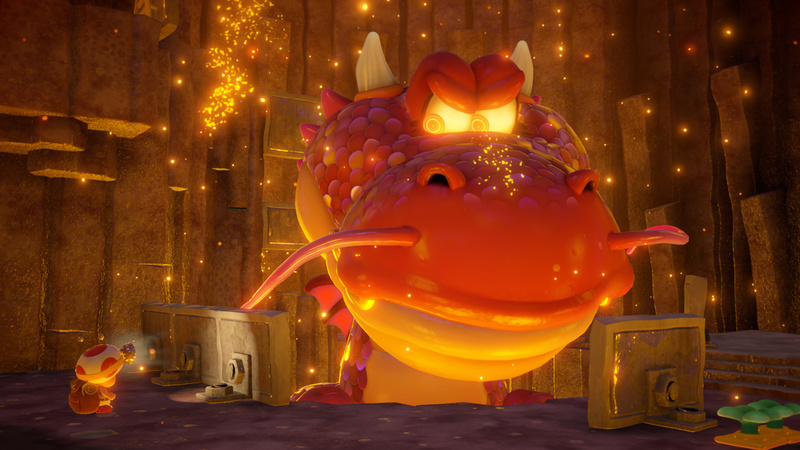 Note: After the finishing the main story I felt like there should have been more diverse bosses than the dragon and the bird. The boss levels seemed a little to repetitive. @Lance168 I'm not sure there is one. I only died 2-3 on certain levels though so I don't think I ever would have gotten one. If there is one be maybe it's a jumping ability! 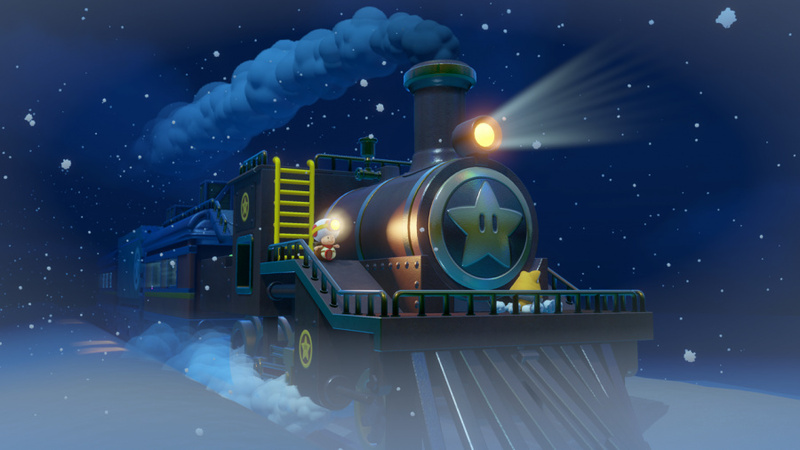 Now we can get lost as Captain Toad in this game! @Lance168 Turns out there is an incincibility item. I guess I missed that part of the review. It is an invincibilty mushroom. Nice review. While I do agree that the primary complaint Thomas had was rather odd and probably misguided, he at least attempted to explain his opinions. Everything was still well written in spite of that curiosity, and 8 is a good score. The review was an entertaining read, and the game itself is very entertaining. I find the main complaint odd, as people on this site will not be seven-year-olds. But the rest of the review seems fair. Nice review and nice score! One of the first 2015 Wii u gems (I live in Europe) I guess! @ThomasBW84 I find the main complaint with your review weird. It seems like most other reviewers (and I, personally) had issues with the camera occasionally and that was the main flaw with the game. I mean, yeah, Mario Galaxy-style point-and-freeze multiplayer would have been nice, but it's omission doesn't detract from anything, whereas the clunky camera controls occasionally do. That said, it's still a fantastic game and I recommend it.